Cyser (honey), sweetened with honey. Sweet, and full body. Tried on tap at the Schilling Cider House. 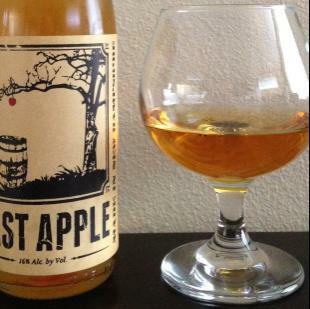 This is a cyser (when apple juice is blended with honey, then fermented). It was then barrel aged in Jim Beam barrels for 6 months. I’ve had both meads and ciders from Moonlight, and now a cyser. On the sweet & syrupy side, but very flavorful. Well hidden ABV. I loved the honey flavor which was bold but not overdone. All around complex and tasty--awesome! Update: I didn't enjoy the bottled version as much...bitter with coffee notes of all things. Disappointing for $26.99 / 375ml bottle! Their How Do You Like Them Apples is a much better deal, for $6 / 12oz can and 13.5% ABV (plus that one is more cider than mead...Last Apple is more mead than cider).